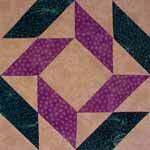 Description: An Appliqu� block traced from an antique quilt owned by Virginia McNair of West Palm Beach, FL and Franklin, NC. 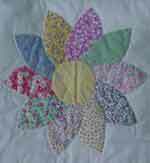 See the original quilt and detail in the article about Virginia McNair. 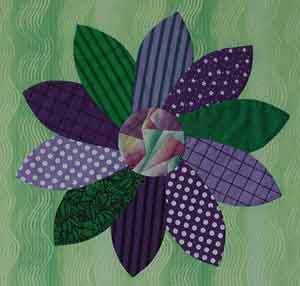 The original quilt uses 10 petals, but you can also do this block with 8 petals. Try doing one in 30's reproduction fabrics or try a totally different look with some bright fabrics. You may do this by hand or machine by various methods. Refer to Placement Of Appliqu� Pieces for position for each piece. Step 1:	Fold your background fabric in half in twice. 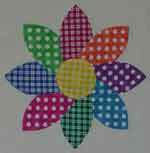 Finger press the fold so you can see the folds for placement of your petals and know where the center of the block is. Step 2:	Pin or glue baste two petals opposite each other on one of the folds, leaving space in the middle for placement of the center of the flower. 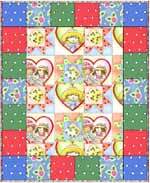 Step 5:	After the applique is done, trim the block background to 12 �" x 12 �".